Senel Coolidge, a young expert of eres, is drifting in the ocean on a small boat with his younger sister Shirley. As food runs out and their strength deteriorates, an island suddenly bursts through the mist and approaches the boat with astonishing speed, engulfing it in waves. When Senel and Shirley awake on the shore, they realize that the island they are on is actually an enormous ship called the Legacy. This game has an interesting way to tell a story, since it's actually has three stories included, there's the quarter part of it, then the other quarter, and finally the half of the game, people say that its actually two and it's just the half part and the other half as well, but I felt that it's three since the two quarters are not similar. As for the story itself, it's actually quite a great story ! and I mean all of the three stories that includes ! it was kind of confusing and complex while starting out, but I've understood it later in the game, and it did left me with a great impression that made me care for the story in this game and it does an amazing work on its character development ! 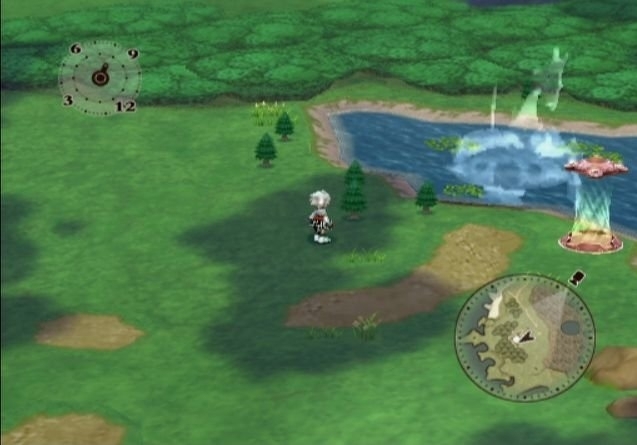 Tales of Legendia is an action JRPG. It has the original style of RPG's of going into a town, going into a field and dungeons and occasionally stumbling into a random encounter to fight enemies with your skills and strategy. You start out in an introduction of the game and then you will experience the game by playing its basic features like being in a dungeon, being in battle, etc. and it won't change its style, however you won't have any tutorials in this, so you might need to read the instruction manual or learn by yourself, making you miss a feature that might've helped you in the game, and then you will get introduced to the first town in the game and from then on, you will experience the game as a whole, occasionally finding a puzzle of some kind while getting near a boss, where it's a green room where you must light a certain amount of crystals with an exclusive item in which it's called the Sorcerers Ring for these rooms only, in order to open a hatch that will take you to the next area where the boss is close by, and you must push blocks and position yourself to shoot a light with your ring to some mirrors that will reflect the shooting range to hit a specific crystal that's hard to reach normally, and the further you go in the game, the harder and complex it gets, but you can also skip these rooms as well without wasting so much time on them, but aside from that, the game doesn't feature much from there. While in the main field, you can travel to go to another designated area or find some treasure chests in it that's secretly placed somewhere, and in dungeons you must go to the end of the area, maybe fight a boss in the end, and both of them have random encounters. This being a game from the "Tales" franchise, instead of using a similar 3D battle system the other Tales game from its time, it uses the "Linear Motion Battle System" that it's reminiscent from the older 2D "Tales" games. The system is a real-time battle and you can have up to 4 characters in your team and in this system, certain selected characters and the enemies fight on a 2D line where control only one character, while the others are controlled by the computer, and in here you can do some of the typical things in RPGS such as fighting enemies which is done in real time, and you can also use items, run away, equip armor, etc. by pulling up a menu in which pauses the game while you pick an option. You can set your controls in "Manual" combat mode which allows you full control over your character's basic movements such as running, attacking, and do special attacks, while with the computer controlled characters you can set them their strategy so that they can fight with a strategy set in mind for example you can have one conserve health or be always defensive, etc. and you can also set their positions for every time you encounter a battle. Another thing in this game is that it also has a Combo system where you can gain combos by constantly hitting an enemy without stopping, and the higher the combo you execute, the more EXP you can earn. While in battle, most of the "Tales" titles uses some sort of special magic attacks known as "Artes", but in here, they're called "Eres", and they are the art of harnessing energies found in some defeated enemies and you can use them to perform extraordinary attacks. You earn them by going up a certain level but also by acquiring a certain amount of eres in order to use it, in which can they be only found by defeating a certain type of enemies, and when getting one, can assign these on a menu and you can perform them by pressing the circle button while also holding a certain direction depending what you've assigned them to, making your characters do a special attack that can help in combat make it more efficient and easier, but it can also drain their TP (magic points in other words) when executed. These feats correspond to each character's skills and are divided into two categories: Iron and Crystal, Iron being more related in melee combat and Crystal being more related to magic of any kind, like fire, water, dark, holy, etc. And you can also transmute these Eres in order to turn them into something more powerful and more effective; however you must use certain Eres that you want to transmute a certain amount of times in order for them to be accepted to be transmuted. 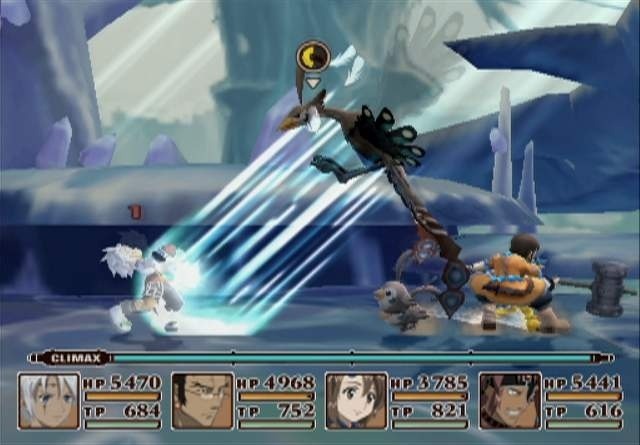 Also in battle you can perform a "Climax" attack, there's a very thin bar just above the characters statuses while in battle where you can raise it by taking or giving damage, and if full, you can press the R1 button in order to perform it, and what it does is that it basically stops time, and your characters can attack the enemies while the enemies are stopped in their tracks, it can help for bosses, but if you press R1 again quickly, you can execute a Climax Combo, where if you have all the characters alive, where you can remove 1/5 of the enemy's max HP and if you perform it later, it's 1/20 instead. You can also see their character's and enemies stats by pressing the R1 button, while you can see the stats of your characters, you can however only see the enemy's HP and TP, since you need a certain item to look at their weaknesses and such. Other things to mention is that you can also bake in this game, where you can get recipes for a certain bread type by locating a strange shape in the field, dungeon, etc. which is an NPC in disguise whose name is Mimi Baker, where she will give you a recipe after a silly cut scene, and you can make this bread when you have certain ingredients for it in order to make it, and these breads have certain ways to heal you unlike the other frequent healing items that you can easily find. And not to mention that you can also make your own items, where you must get a certain tool items so that you can take them to an item builder so that it can make an item for you, it's very simple, but the tool items can be hard to collect ! Also in battle in the victory screen, you also have a "Grade" meter where it measures your skills by your actions in the battle that you've won, where being good can grant you a lot of points, while doing awful will give you minus points, and these points will be used when you've beat the game (more on that later on). Since I've chose the Easy option, The game felt easy for me (not a bad thing for me mind you) in both quarters of the game, while I did needed to do some serious strategy in the half of the game and also in almost all of the bosses in the game and not to mention that I needed to purchase the latest strong armor and weapons to keep up with the game, there is however a difficulty option so that you can select the difficulty of the game in the options menu, be it Easy, Normal or Hard, but I did heard that the veteran gamers said that this game was easy either way, so I can't say for sure. This game has been panned by the fans of the series since it doesn't innovate anything like the other "Tales" game such as symphonia, Abyss, etc. during it's time, and I do admit that the game can be punishing and boring due to its excessive backtracking and the battles can be simple and boring as well, I can understand why the "Tales" fans to critically hate this game, but other than that I did enjoy the game myself, it was tolerable for me and also because if it wasn't for its other great assets I couldn't enjoy it as much as I did now. 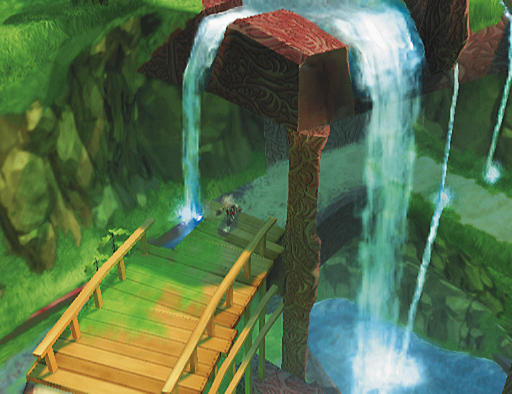 The whole look of this game looks great, while some designs look very simple in terms of details, other designs look just as great as they should be, its greatly colorful, a great placement in the lightning apartment, and some of the water effects and other design choices can look even amazing ! The character models have been made to look like little chibi characters instead of actual normal looking sizes of the characters, however it's still works due to the characters like this still express emotion that you can see and understand on how they feel instead of not knowing how they feel and thinking that this should've been better, and the game does have anime cutscenes as well, while they're barely in the game, they're in this game and they look really amazing ! the details, the animation, everthing looks great ! not to mention that the characters were designed by Kazuto Nakazawa, the same animator that directed the animated sequence of Kill Bill Vol. One and the same character designer of the Samurai Champloo anime ! and as for the whole look for this game, it looks great on its own, but again, it might not look that good if you love the other "Tales" games. Now this is the reason why I love this game ! this game has one of the most amazing soundtracks I have ever heard ! This soundtrack, composed by Go Shiina, has a great variety of classical orchestral scores, and others such as amazing vocals and much more ! While most of them do sound fitting in some situation, some of them really don't, but they don't overstay it's welcome due to how amazing the songs are ! so even if you haven't played this game, you must experience this amazing soundtrack ! you won't regret it ! The sound effects are all very simple and have minimal impact in general, like the attacks and the sound of the enemies defeated leave something to be desired, and not to mention that when the characters speak in battle they tend to repeatedly speak while doing their actions in which later it can become a jumbled mess and this can become very annoying to a lot of people, but it was tolerable to me however, but as it is, the sounds overall are still ok sounding and in some cases it can work sometimes but it just could've been better with some proper work to be honest, as for the voice acting, they all sound great, they all have the quality of a dubbed anime, and while there are a few questionable voice acting moments (more specifically Scott Holst as the voice of Senel Coolidge, the main character and definitely Carrie Savage as the voice of Shirley Fennes), others do their work very well ! not to mention that it also has the great talents of Cam Clarke, Heather Halley and Steve Staley ! I did say that the graphics are simple in terms of detail, but the thing is that all of the over world takes place on a giant ship, big enough to have a lot of landmarks, mountains, and much more ! but in a way, it doesn't look like you're in a ship, but at the same time, it shouldn't be ! while some environments can look pretty simple, however the game does have some areas that are unique, cool-looking, and even deeply atmospheric at times ! while the rest does look nice but small in terms of its own atmosphere. I thought that the characters in this game were overall developed greatly, while they didn't truly shined in the first quarter of the game, it was understandable, since it shows the cons of their character development, to where in the second quarter makes them look better by improving their quality and understand why their previous quality was not that great, and then it gets even better in the second half, since it ties in to each character all while at the same time following a separate story, and in my opinion this is an amazing way to develop your characters in a story, since it feels like you've known them for some time, but then it gets better when you're treated to their stories, and that's just something to give a lot of credit for ! And not to mention, like any other "Tales" game, there are these skits that can be available when doing a certain action or when triggering a cut scene, where it's a moment where the characters talk on a topic of discussion and most of these are played for humor, enhancing the whole personality and care of the characters ! As for the replayability, you can spend a lot of time with this game ! you have an item called the Collector's Book, where it can chronicle all the items that you've collected in the game, and you can collect all of the Eres stones, all regular items, tool items, all the weapons, all the armor, all the accessories, all the valuables, all the bread in the bakery, Etc. there's also some sidequests that you can do in the game as well, an Arena that you can unlock in half of the game, where you can participate to where the harder the matches, the good the quality of the prizes will be ! Another thing that gets unlocked in the half of the game is the Sorcery Scanner, where you can locate hidden items in certain areas that you've visited by pressing the L2 button, you can also collect every single bread recipe hidden throughout the game. There's also the titles for each playable character in the game that you can collect, where doing a certain action or triggering a cut scene will grant you a title, and these can enhance your character's status in some way, think of these as achievements... but that benefit you in the game ! And finally you can access the Grade Shop b beating the game, where you can spend all of your grades by buying extra content in the game, such as alternate costumes (but they will be permanent when you change the costumes ! ), inherit data such as the money that you've collected, the play time, the Eres moves, etc. and you can increase the amount of items that you've collected and more that will be carried in the New game +. and if that wasn't enough, it took me about 80 hours to beat this game, and not in 100% completion mind you ! Your review was confusing in a few instances, but overall it was very enjoyable! 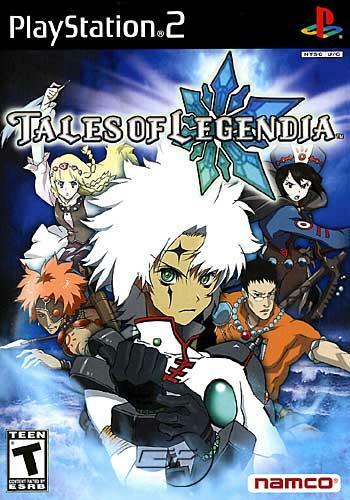 Very cliché story, but overall I did enjoy Tales of Legendia.